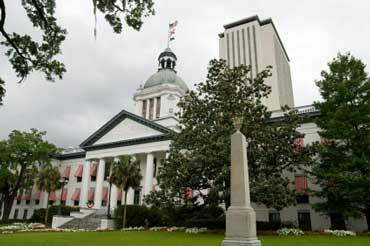 Tallahassee is the capital of Florida. This is a photo of the current and former state capitols. The old capitol is the short building in the front and the current capitol is the tall building in the back. What is the state tree of Florida? 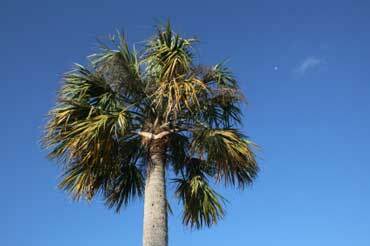 It is the sabal palmetto. They grow up to 65 ft (20 m) tall, with a trunk up to 2 ft (60 cm) in diameter. 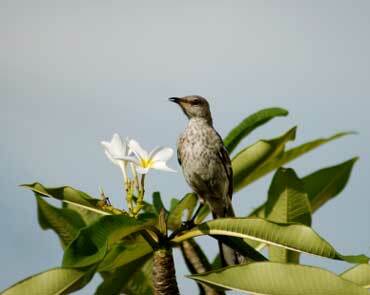 Mockingbirds mimic the songs of insects and other birds. Sometimes they whack people in the back of their head if they walk too close to a nest. Copyrights to the pictures and photos on this civics 50-states photo tour website belong to individual photographers. We have purchased the rights to use them. Do not copy the photos on this website. You may print any of the worksheets for classroom use. Contact Christina Niven at christina@elcivics.com. Please send corrections, comments, greetings, and requests for new photo tours, state lessons, and civics units. Copyright © Christina Niven, 2007.